What is Net Cash Flow? Home » Accounting Dictionary » What is Net Cash Flow? Definition: Net cash flow is a profitability measurement that represents the amount of money produced or lost during a period by calculating the difference between cash inflows from outflows. This metric is typically an indicator of a firm’s financial strength, providing it with the ability to operate, develop new products, expand into new markets, invest in research, reduce debt, and increase shareholder value. What Does Net Cash Flow Mean? What is the definition of net cash flow? Firms with long-term positive cash flows are financially healthy and meet their short-term obligations without the need to liquidate their assets. Conversely, companies with long-term low or negative cash flows are financially weak or even on the verge of bankruptcy. Short-term negative cash flows may also indicate that the company has invested in the construction of a second factory or in expensive new equipment. As soon as the investment begins to generate revenue, it will outweigh the failing of short-term weak cash flow. Company ABC is a manufacturing company and a leader in the sector. The company seeks to expand its operations and has invested in the construction of a second manufacturing plant for a total cost of $1.8 million. As a result, the company incurred a negative net cash flows for 2015. The company’s total net cash flow formula is the sum of the operating cash flow, the investing cash flow and the financing cash flow for each year. Although the investment in the second manufacturing plan justifies the negative cash flow for 2015, the company cannot sustain a poor NCF for many subsequent quarters because such signs may indicate financial danger. Furthermore, financial analysts are using cash flows as an indication of financial health, but they compare them to the company’s debt, changes in fixed assets and other indicators that can justify an increase or a decrease in the NCF. Define Net Cash Flows: Net cash flow means the difference between the money a company generated in sales and the money it spent to generate the sales. 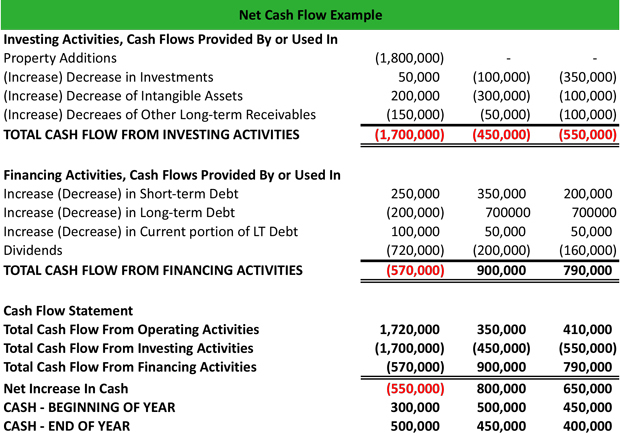 1 What Does Net Cash Flow Mean?